The effect of today’s Non Farm Payroll Data cannot be underestimated for a number reasons as it proves, once and for all, the cat’s cradle that is the financial markets. Should the numbers come in better than expected then this should prove beneficial for equities as the market has proof positive that the worst is definitely over and the recent stock market rally has been founded on solid fact rather than mere sentiment and wishful thinking, low volumes notwithstanding. This picture would also confirm that the worst of the downturn in the housing sector is over and that a stable housing market could even feed through into accurate pricing for the sub prime mortgages still sitting on the Banks’ balance sheet. In addition it would signal that the great American consumer is now ready to start spending once again. The consequence of this scenario is that the US Dollar would continue to weaken and commodities, such as spot silver continue higher. However, if the number is worse than expected then clearly the worst is not over, consumer spending will fail to pick up, and equity markets could suffer a serious correction. This could lead to a bounce back in the US Dollar which would trigger a fall in silver prices and perhaps establish that despite China and demand from the emerging markets, the fundamentals do not support the current price level for spot silver. 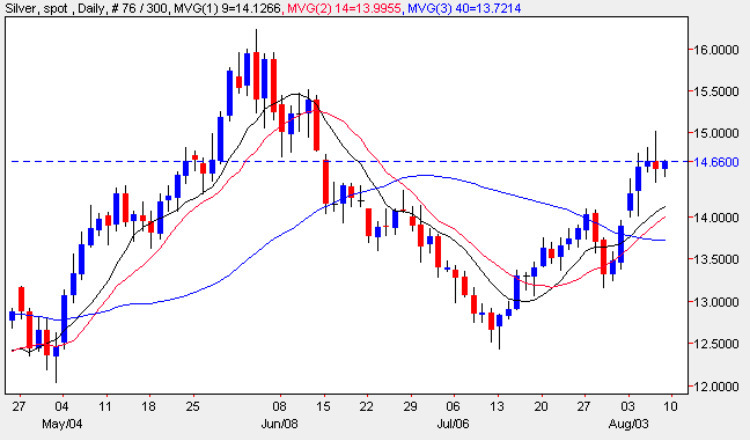 From a technical perspective yesterday’s candle on the silver chart provided us with an extremely worrying signal, ending the silver trading session as a shooting star – a bearish signal. What is particularly concerning is that the high of the upper shadow failed to breach the $15 per ounce level where strong resistance now awaits. In addition this bearish signal should be read in conjunction with that on the daily gold chart where we concluded with a perfect long legged doji, which again is symptomatic of a reversal in the recent rally or, at best, indecision in the market. The depth of any move lower for silver prices will largely be dictated by the $14.24 price point and should this region fail to hold then we could see a deeper move to re-test the bottom of the support level in the $13.50 price band. Should the move be accompanied by a breach by one, or all three, of the moving averages then this will confirm any bearish move lower.